Summer time is here!!!!! I know this not because I feel the summer temperatures heating up, because I am living the privileged life indoors, but my best friend Bryan who works here in the kennel has started appearing for more shift lately which tells me it is summer. I love my Bryan time! When I can sneak him away from all the clients and other pets, I monopolize his time to give me belly rubs and tell me how I am the best kitty ever. 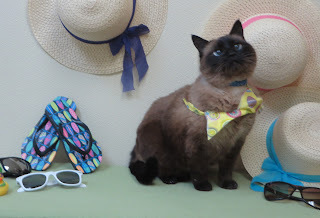 With that being said and knowing Texas can be a scorcher, I figured I am on cat duty to educate you on avoiding summer hazards. First I would like to talk to the clients that I like to refer to as exceptional pet owners. These are the people who take their dogs for walks or even take them to dog parks to let them release all their built up dog energy. I’m telling you these dogs, you release the leash and they are like Augustus Gloop in the Chocolate Factory, they go crazy running around with their tongues hanging out as if they forgot how to be dignified. Anyways, I wanted to remind these owners to make sure their dogs paws are protected from hot concrete and carry water and a bowl to offer their dog a sippy sip to make sure they do not overheat. To those pets that spend quite a bit of time outside, you should provide shade to avoid sunburns. That’s right I said it, dogs too can get sunburned and shade helps prevent heat exhaustion. If you have a pool, make sure it is gated to avoid accidental drownings. It’s devastating to see these types of emergencies come in the clinic. I don’t look pretty when I cry, so let’s avoid these types of visits please. Something else that should be avoided in the summer is leaving your pets in the car. Did you know it could be 78 degrees outside, but a car parked in the shade can register at 90 degrees and a car parked in the direct sunlight can get up to as high as 160 degrees. Let’s face it guys, it’s not 78 degrees here in Texas, so I don’t even want to think how hot cars actually get in our summer heat. That makes my brain hot just thinking about it. So it’s not just the heat in Texas that causes problems in the summer, have you heard of the pesky little mosquito? Yeah you know the tiny insect that makes you do a dance and slap yourself silly? Yep, that’s the one. Well these little pest are not only going to annoy you, but they carry heartworms, so please be sure to protect your pets by giving them a monthly heartworm prevention. It doesn’t matter if I’m an indoor pet or an outdoor pet, I need my monthly heartworm prevention because even when I asked for a sign to be put up that said “Mosquito’s Keep Out,” it did nothing because come to find out mosquitoes can’t read. I have seen what a dog goes through when they come in for heartworm treatment and it’s not pretty. Not to mention they have to endure strict cage rest for a month after each treatment and that is dog gone crazy talk. Worse than that, there is no treatment for cats! In addition to those mosquitoes, I am not fond of the fleas or ticks. These little guys are just down right nasty. They make me itch, they feed on my blood, ewwwww and they lay up to 50 eggs a day. What is wrong with them? Have they ever heard of over population? Heartworm and flea prevention is the way to go, just sayin’.